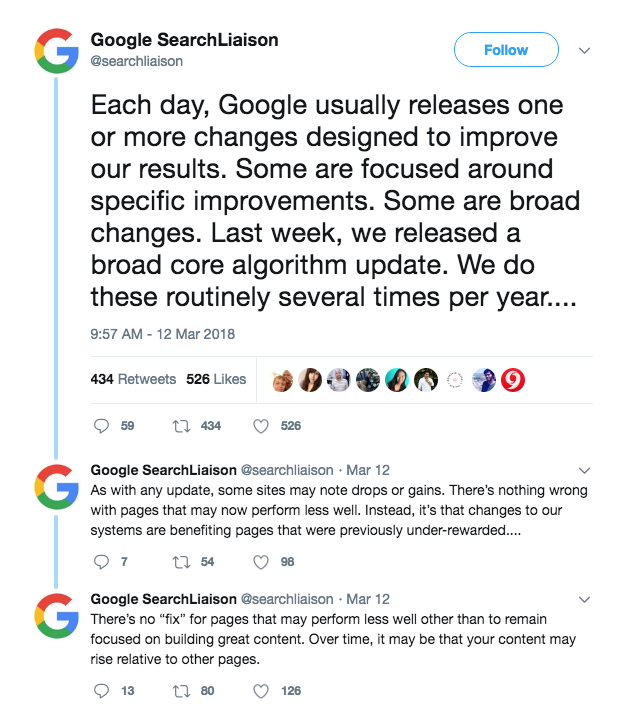 According to Barry Schwartz of Search Engine Land, “This algorithm update seems to be a more significant update, based on many of the metrics we are tracking. Google’s aim with these updates is to improve the overall quality of the search results provided to searchers.” However, Google has stated that webmasters do not need to make any technical changes in compensation for the rollout stating that “no fix” is required. The core update is simply designed to promote websites that were once unvalued. What should you do if you are seeing rankings and traffic changes? The best thing to do for the time being is to be patient until the core release is complete and then re-analyze your website metrics. Google recommends that you continue to make changes to further improve the user experience and add even better quality content to your website. If by next week you continue to see drops in regards to your keyword rankings and traffic we suggest reaching out to an SEO expert who can run an audit to identify areas that may be putting your website at risk.